Only two days ago, the developers presented the awesome Call of Duty: Ghosts trailer, in which they promised to escape the gamers from their daily routine and allow them to plunge into the new DLC. Yesterday another one video about the upcoming add-on was published. 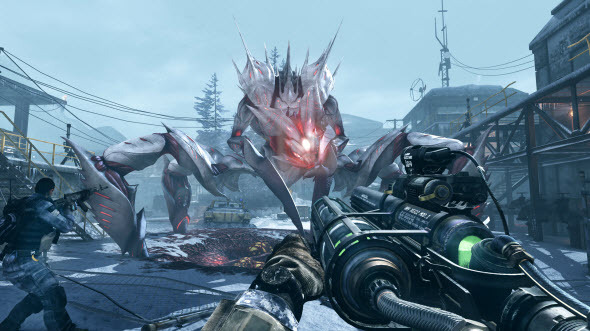 Fresh Call of Duty: Ghosts trailer reveals the details of the first episode for the Extinction mode. Let us remind you that this mode allows gamers to fight against the extraterrestrial creatures, which are going to occupy our planet. The first episode will tell us about how this conflict has started, and new Call of Duty: Ghosts trailer already reveals some details. According to the video, the army has already had a skirmish with aliens, in which humans have won. The scientists examined the samples of the dead creatures, and suddenly the latter ones turned out to be alive. You, as a part of an elite team, will be trying to save the researchers and the planet from these martial and dangerous monsters, but this task won't be simple. How do you like new Call of Duty: Ghosts trailer? Has it convinced you to buy Onslaught DLC? Let us know in the comments below.